TICKETS FOR BODY & SOUL! 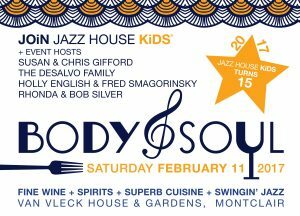 Get your tickets for Body & Soul on Saturday, February 11, 2017! Jazz House Kids heats up the town with a celebration for the senses. It’s a chance for us and our friends to strut the dressy side of jazz with an evening of grown-up fun. We’ll be returning to Van Vleck House & Gardens, a historic 12-acre estate owned by the Montclair Foundation, which offers the perfect setting for our journey through the eras. Trust us–this is no fussy fundraiser! The Patron Event “Early Show” starts the celebration at 6:30 pm with a tasting of exclusive wines and spirits. Each bottle poured is perfectly paired with fine cuisine and soulful music from the Jazz House Alumni Band. Patrons enjoy complementary valet parking. Patrons stay for the Main Set! The party is just getting started! At 8:00 pm, we open the doors for the “Main Set,” and that’s when things really heat up with our trio of jazz clubs – Big Band, Soul Jazz and Bossa Nova. Each room has its own special own vintages, menu and live band to match the mood. 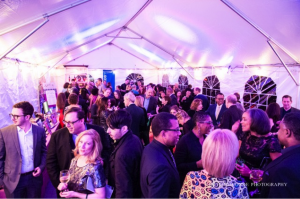 Wine enthusiasts and jazz fans alike roll from club to club throughout the night, soaking up the celebration and savoring the music. 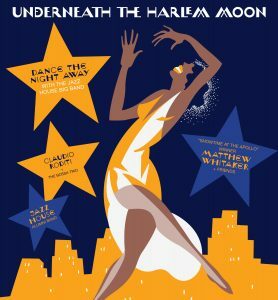 Dance the night away with our own award-winning students in the Jazz House Big Band directed by Julius Tolentino! 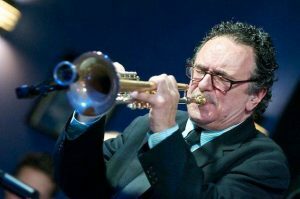 Brazilian trumpeter Claudio Roditi is a two-time GRAMMY Award nominee, and has played alongside Dizzy Gillespie, Jimmy Heath, Herbie Mann, Horace Silver, Charlie Rouse, McCoy Tyner, Gary Bartz, Paquito D’Rivera and a host of others. With a maturity and musical depth well beyond his years, Jazz House Kids student Matthew Whitaker has performed all over the world and has played alongside an “A” list of music luminaries. He began playing piano at age 3 and plays the organ and drums too. 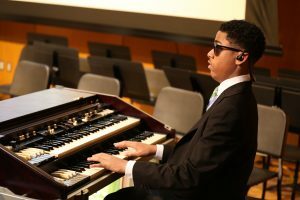 He’s the youngest artist honored by the Hammond Organ Company in its 81-year history. This past December, the world got to see Matty on FOX TV as he won the competition at “Showtime at the Apollo.” A frequent performer at the Apollo, in 2013, Matty was also was a winning participant in the “Amateur Night at the Apollo Child Stars of Tomorrow;” opening for Stevie Wonder’s induction into the Apollo’s hall of fame. The Main Set will also feature live and silent auctions with some prizes you won’t want to miss! 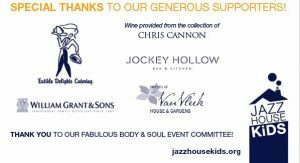 Many thanks to our Body & Soul Host Committee Members! It’s not too late to join them by stepping up your support. 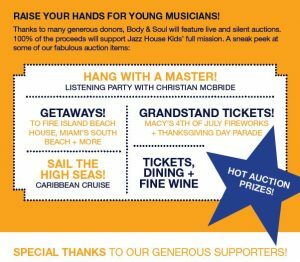 Join us on the Body & Soul Host Committee! Special thanks to our generous hosts, Susan & Chris Gifford, The DeSalvo Family, Holly English & Fred Smagorinsky, and Rhonda & Bob Silver for their steadfast support. We invite you to join us as a special friend of Body & Soul. 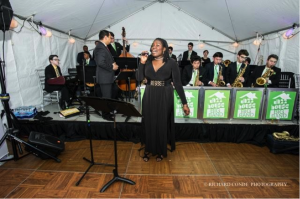 Whatever level you choose, you’ll know you’ll be making a difference in students’ lives by supporting the more than 40% of our young people we provide tuition assistance, private lessons, transportation, even food and housing for our Jazz House Summer Workshop. 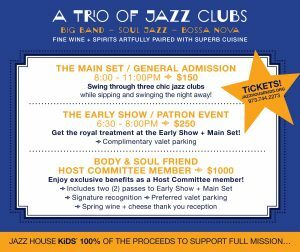 For more information about the perks of becoming a Host Committee Member, click the link below and contact Jazz House Kids Director of Development, Anneke Demarest at ademarest@jazzhousekids.org or 973-744-2273.